“My far-away, unknown colleagues and friends – take pictures with your heart!” – a phrase left by Jan Bułhak in one of his books, like a testament for future generations of photographers. He considered these words to express the whole essence of his life. Jan Brunon Bułhak is considered to be the most famous Vilnius photographer of the first half of the 20th century. He was born in 1876 in the medium-sized manor of Ostasin, near the city of Navahrudak [now in Belarus]. He started taking pictures in 1905, when his wife received a photo camera as a gift. Bułhak became so interested in photography that a short time later he established a photo studio at an estate near Minsk. He then left for Dresden, to study photography with a famous photographer named Hugo Erfurth. The happiest turn of events in Bułhak’s creative life was making the acquaintance of an artist named Ferdynand Ruszczyc, who was living in Vilnius at the time. After receiving favourable comments regarding his first recorded images, Bułhak moved to Vilnius, where he opened an artistic photography studio and began taking pictures of the city and its architectural monuments, inspired by Ruszczyc himself. An exhibition of photography recently opened at the M.K. Čiurlionis National Museum of Art in Kaunas commemorates 140 years since the birth of the classic photographer and is entitled “Jan Bułhak – Take Pictures with Your Heart!”. The exhibition was prepared using the author’s photographs, as well as postcards featuring images taken by Bułhak, all of which were preserved by the museum. During preparation for this exhibition, the museum reviewed its photography sets. After the authorship of the exhibits had been updated, and the locations and objects photographed had been identified, it became clear that the various departments and sections of the M.K. Čiurlionis National Museum of Art hold 269 original photographs, 41 photo-postcards and 3 signed postcards – a total of 313 exhibits relating to the cultural heritage of Jan Bułhak. In the photographic library and department of documents is stored one of the most important and valuable collections of photography in the museum – 143 photographs by Jan Bułhak. This set forms part of the collection once owned by the famous interwar diplomat and collector Vladas Daumantas. In July 1944, Daumantas entrusted most of his valuable works of art to the employees of what was then the Vytautas Magnus Museum of Culture in Kaunas, and moved to Germany together with twelve boxes of other valuables; in 1951, he settled in the US. That is how his books, pictures, sculptures, furniture, carpets and other valuables –including Bułhak’s pictures – became museum property. There is almost no doubt that the collection of photographs by Bułhak presented to the museum by Daumantas – all 143 printed positives – had been prepared for exhibition. It has been noted that the collection is made up of the most important, most characteristic and most artistic images captured by Bułhak. Another thing that suggests that these photographs had been displayed in exhibitions at the time is the presence of recording descriptions. All of the photographs are glued to a card bearing an embossed stamp and containing the photographer’s details – the same stamp can be seen on all of the photographs. A branded photographer’s label with a stylised Vytis [the historic coat of arms of Lithuania], produced by Ruszczyc especially for Jan Bułhak, is glued to the other side of the photographs. Most of the labels feature a year: 1916, 1917 or 1918. In this case, the dates are specifying not the date when the photograph was taken but the date of the reproduction of the image – i.e. the negative print date. It is agreed that among the best and largest collections of images of Vilnius and its artistic monuments by Jan Bułhak are those taken before World War I . The photographs in question exactly capture those times. A great number (almost half) of these 143 images are panoramic views of Vilnius, the buildings of the city and their interiors, or of architectural details. The paths taken by Bułhak as a photographer were usually limited to the current Old Town – where he recorded wonderful panoramic views of Vilnius from atop the surrounding hills. The photographer did not shy away from climbing church bell-towers and immortalising the city from above: there are photographs taken from the bell-tower of Vilnius Cathedral, and the arches of the bell-tower artistically frame some of these panoramic views. Compositions of this sort are typical of Bułhak’s art: he liked to take pictures from dark places, framing his pictures with architectural details. It is believed that the photographer searched for such viewpoints for a reason – since the panoramic views of Vilnius reveal the exceptional beauty of the Old Town . Bułhak once confessed to the famous geographer, zoologist, writer and professor Benedykt Dybowski that he dreamt of buying the highest firefighter’s ladder so he could photograph everything from any height he chose. A look at the collection under discussion makes it clear that the largest part of the images of Vilnius consist of churches. These images were taken not only from outside, but also from inside, with lighting and angle chosen so that the image is not static, but is artistically effective. 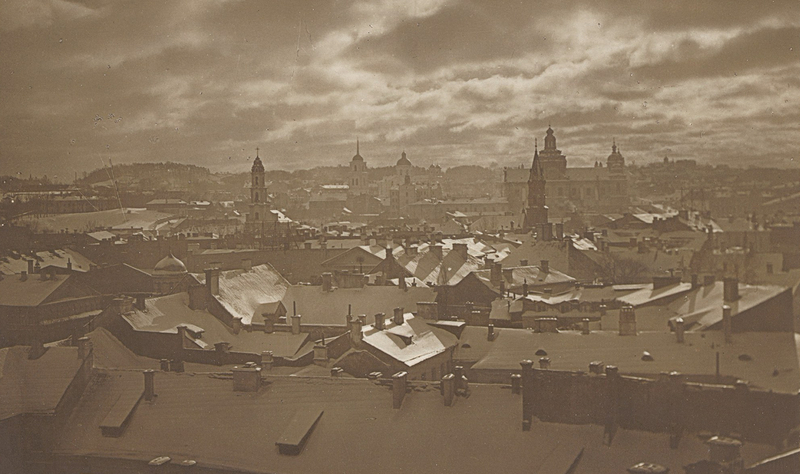 Bułhak also took pictures on the order of the Vilnius city administration, and the author received complaints from bureaucrats that his photographs were more ‘picturesque’ than documentary. The photographer paid a lot of attention to both exterior and interior details, to sculptures, sculptural elements and paintings in churches. As well as sacred buildings, the photographs of the collection also commemorate other sites: the Three Crosses monument, the Governor-General’s house (now the presidential palace of the Republic of Lithuania), the Jewish cemetery in Šnipiškės, the Bernardine Cemetery in Užupis. Bułhak did not only take pictures of specific buildings; he also recorded artistic images of streets (Švarco, Bokšto, Tilto, Sv. Ignoto, S. Skapo) and their internal courtyards. Bułhak’s pictures immortalised the suburbs of Vilnius (Antakalnis, Tuskulėnai, Žvėrynas) as well as areas which were not part of the city at the time (Karoliniškės, Pūčkoriai, Kalvarijos, Žalieji ežerai). The photographer managed to capture equally impressive pictures while visiting Trakai and Užutrakis. Bułhak tried to capture the already beautiful view of the surroundings of Trakai in an even more interesting way – he tried capturing water reflections, clouds and sun rays. His images of the ruins of Trakai castle were composed so that the ruined towers would look like they were framed by castle walls. Bułhak created artistic compositions of nature and architecture while taking images of Užutrakis. His other photographs, named “Surroundings of Vilnius” do not specify exact areas. They are usually views of nature: fields, forests, water sources, ploughed land and manor houses. The photographs are artistic, taken at sunset or sunrise, with the fields covered in fog. The photographer played with reflections in the water, and paid attention to the sky and clouds. These views of nature remind the viewer of the pictures of Jan Bułhak’s best friend: the artist Ruszczyc – the photographer from whom he learned to created images similar to paintings. Other pictures of importance to Lithuania were taken in areas now belonging to Belarus. These images immortalise the castles of Kreva, Navahrudak, Mir and Nyasvizh. As is characteristic of Bułhak, the buildings are pictured not only by themselves, but with additional details: water reflections, natural lighting and clouds. its environs, which are located near the city of Navahrudak and the photographer’s home town of Ostasin. Bułhak frequently travelled to this lake with his family when he was young; later in life, the surroundings of the lake prompted the fondest emotions and memories in him . So it’s no surprise that Bułhak wanted to immortalise the places of his childhood, what he called “the wonderfully noble beauty of Svitjaz”. Other places Bułhak photographed that are now in Belarus included Ashmyany, Navahrudak, and the surroundings of Minsk. These were all places that were very close to Bułhak: the future photographer was born and spent his childhood years in the village of Ostasin near Navahrudak, and the small manor of Peresiekos near Minsk was where he lived and created his first photo studio. It is only natural that the collection of Bułhak’s photographs includes views of these locations – artistic pictures of nature, field paths, water sources, park avenues and fragments of buildings yet to be identified. A completely different part of the collection of Jan Bułhak’s photographs are kept in the archive of the Folk Arts section at the M.K. Čiurlionis National Museum of Art – specifically, in one of its departments: the A. Žmuidzinavičius’s Collections and Creations Museum. Here are the pictures by the famous photographer that were ordered by the Lithuanian Arts Society: photographs of paintings and sculptures. The sets preserved in both the department and the sub-department feature mostly images of distaffs, distaff boards and washing paddles, as well as a lot of pictures of carved wooden plates. It is typical for one photograph to capture a composition of not one or two, but a group of similar objects, such as extraordinarily finely carved pins, wooden spoons, small knives, forks or carved wooden nutcrackers. A couple of photographs show artistically carved horns, a wooden candle-holder or a carved small cross. The photographs don’t only record wooden objects; they also show textiles – a woven glove or various fabrics (maybe bedclothes or tablecloths), as well as fragments of aprons from the region of Suvalkija with embroidered tulip motifs. The photographs also feature a very interesting belt with its author’s name woven onto it: “woven by Petras Rimša in 1913”. In 1925, the museum received custody of the Folk Society collection, and after that most of these objects photographed by Bułhak could be found in the Folk Art Department foundation. The A. Žmuidzinavičius Collections and Creations Museum keeps the Bułhak photographs, which recorded the works of professional artists – for example, the Petras Rimša sculpture “Ploughman”; “Fright”, a work by sculptor Juozas Zikaras, which is unlikely to have survived until the present day; and four works by Petras Kalpokas. A large proportion of these photographs were publicised in the annual art exhibition catalogues of the Lithuanian Arts Society, which were published in 1912 (VI), 1913 (VII) and 1914 (VIII). Additionally, the museum contains four very interesting portraits of Antanas Žmuidzinavičius. In one of the pictures he is displayed wearing a folk belt against a background of a hanging folk belt; the other is a portrait in profile. The other two portraits shine with their wisdom, the artist posing to the photographer wearing a fur hat and a winter coat. Since Bułhak learned from Hugo Erfurth, a famous master of portraits of that time, it is not surprising he made such professional photographs. Reviewing the artistic heritage of one of the most famous photographers of Vilnius of the first half of the 20th century, preserved at the M.K. Čiurlionis National Museum of Arts, one can clearly see the versatility and professionalism of this classic photographer. As well as his most famous works, such as images of Vilnius, buildings and architectural details, he also recorded artistic natural landscapes, professional portraits and documented people’s works of art, paintings and sculptures. Jūratė Gudaitė, „Vilnius Jano Bułhako fotografijose“ (Vilnius in Jan Bułhak’s photographs), in: Jan Bułhak, Vilnius, book 1, compiler Jūratė Gudaitė, Vilnius: Lithuanian National Museum, 2012, p. 14. Jan Bułhak, Šviesos estetika: fotografikos pagrindai (The Aesthetics of Light: Photography Basics), translated by Stanislovas Žvirgždas, Vilnius, Lithuanian National Museum, 2008, p. 65. J. Bułhak, Vaikystės metų kraštas (Land of the Childhood Years), p. 195-197. Aidas Kulbokas was born in Panevėžys in 1987 and now lives in Kaunas. In 2011 he graduated from the bachelor’s study programme in Ethnology at Vytautas Magnus University; after that, he continued studying at the same university, and in 2015 graduated from the master’s study programme in Ethnology and Folklore (Comparative Cultural). Since 2011 he has worked as a museologist in the Department of Photography and Documentation at the M.K. Čiurlionis National Museum of Art.